Almost there, and the return of Lambchop! With any luck, we will have our first “Core on Deck” by this time tomorrow. It is a very exciting time! I took a picture of how foggy it is outside, you can only see about 10 feet. I took this picture from the front of the boat, which is called the “bow”. There are icebergs nearby, fortunately the captian can see them on radar so we do not run into the icebergs, but we can not see them through the fog. We had one of our weekly lifeboat drills today. This week we got into the lifeboat. Here is a picture of the lifeboat from the door. This lifeboat is designed to seat 70 people, and the JR has 4 on board. The JR only needs 2 of these to evacuate everyone on board, the reason there are 4 is these boats are VERY cramped with 35 on board. With 70 it’s even worse. Here is a picture with a few people on the lifeboat, they are sitting as though there were 70 people on board. Imagine spending a day or three cramped up like this. It does not sound very fun to me or Lambchop. Speaking of Lambchop, she is feeling much better, and wants to thank everyone for your support and well wishes! She is now going to continue showing you how she studies the core when they come on the ship. 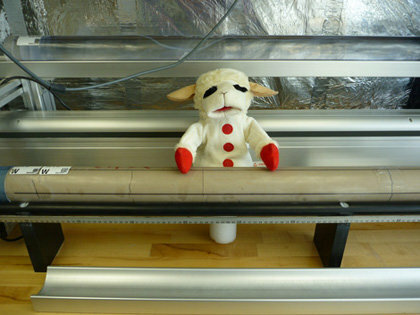 When we last left Lambchop, she was waiting for the cores to warm up to room temperature. After this, the then cores move over to the “Whole Round Multi-Sensor Logger”. This is a tool that measures the core before anything is done to it. Lambchop calls this the MST because she does not want to keep saying “Whole Round Multi-Sensor Logger”, and can you blame her, that is a mouthful! The reason it is called the “Whole Round” is because the cores come out of the ground round, and after a series of tests, the “Whole Round” core is split in half. One of these halves is a working half and an archive half. The working half is where Lambchop and all the other scientists do all of their research on ship, and later on shore. The archive half is photographed and scanned, but no samples are taken, and it is then stored. That way, as technology advances, we have a section that has not been disturbed so that it can be studied in the future. So now that the core is in the MST, it is measured 3 times. These are Gamma Ray attenuation bulk density, Magnetic Susceptibility, and Whole-Round P-Wave Velocity. Now, each one of those measurements sounds kind of complicated, but Lambchop is sure it will make sense shortly. And Lambchop has nicknames for each of these sensors too! But you will have to wait for her to explain those until next time, she has to get back to work today, lots to prepare for so she is ready for “Core On Deck”!